The joy of painting with a paletteknife must never be underestimated! The key to selling more work is to find your own voice, they say. All artists have a unique voice and we can all find it. TODAY I share my latest abstract painting with the world. Enjoy! This time of the year is colourful and wonderful. Autumn burst all around us in joyful colours! I love to paint, to do art, to be creative! It is important to get outside your own head once in a while and look at the world from a different view. I need to find a way to constantly expand my creative horizons. I need to find a way to create something (anything) that wasn’t there yesterday and then offer it to the world. 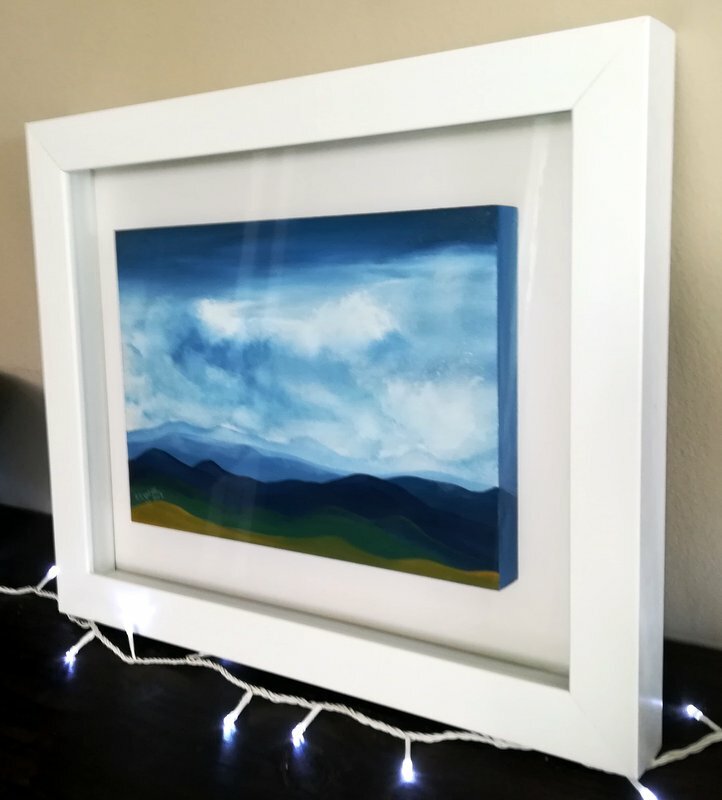 I am priveleged to share what I create! I make some time every day to just listen to that small creative voice from inside. It became a challenge to me to find some reason to keep trying, keep painting and enjoying! I think we do tend to underestimate the value of connecting with others. I know that for me personally, just the energy, encouragement, ideas and enthusiasm I usually get from talking with other artists, friends or relatives is well worth the effort. I created a page on facebook with the name: Happy Art . You are welcome to visit and like it, thanks so much! HAPPY ART’s motto: Happiness is not always an option, but positive thinking always is. 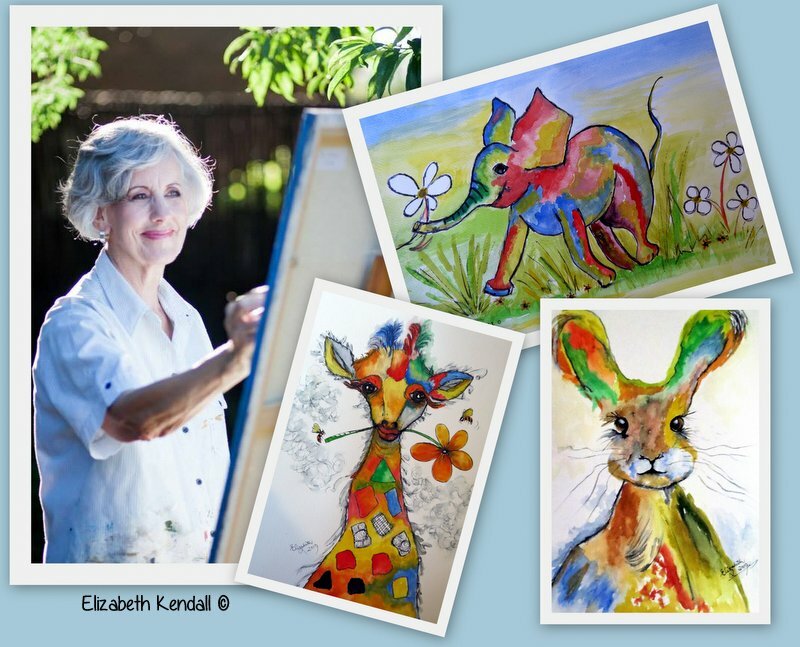 What I share on my page can be seen as POSITIVE PICTURES, colourful and joyful. Something to put a smile on your face and joy in your heart. Thanks so very much for your support, it is much appreciated. 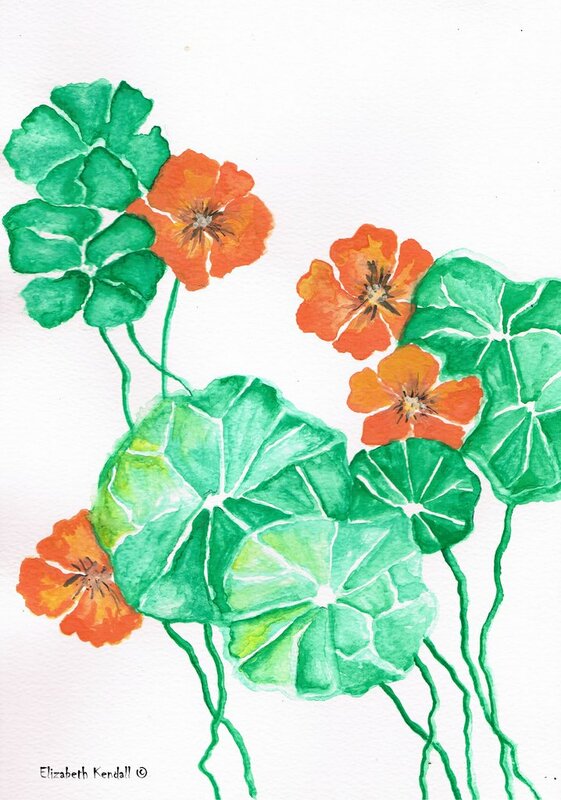 Nasturtiums, every garden should have some. And you should have this painting! 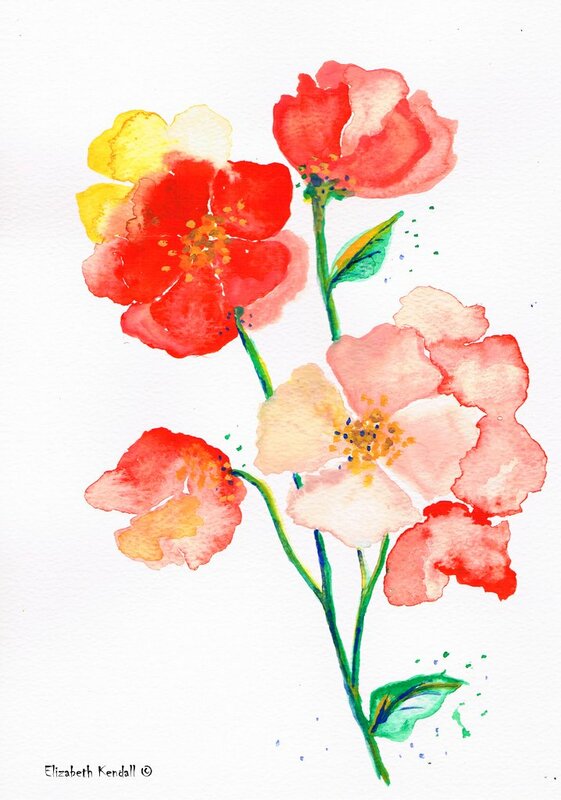 To use waterpaint when painting flowers is such a joy! Here are two of my latest and simple watercolour paintings. Sometimes a person makes him- or herself believe they can't do a certain thing! For me it was always a challenge to paint a face. I enjoy painting landscapes: trees, water, clouds. Then one day, I tried something new! Faces. After painting three different faces, I longed to paint trees again. Life is interesting. I'm happy to share my work and hope you enjoy it too! Thanks for visiting my blog. Palette knife art, so much joy! 43 x 35 cm. Painted on an x-raysheet. When framed, it looks wonderful! Available. Oh, I love to paint clouds. They change continuously. And always inspiring! 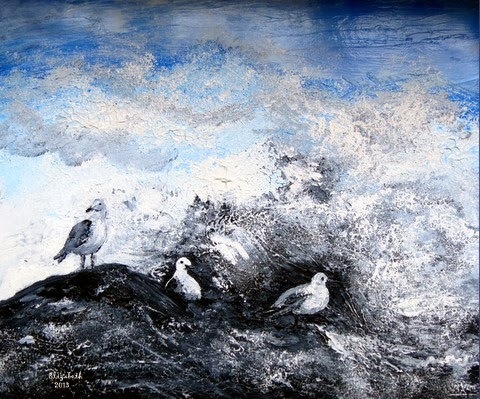 This painting was done with a palette knife and brush, acrylic paint on an x-raysheet. Size: 40 x 30 cm. Available. Something different! Abstract painting, playing with paint for hours. 43 x 35 cm. on an x-raysheet, available. THE FACE. Acrylic on x-ray. Colourful and new! 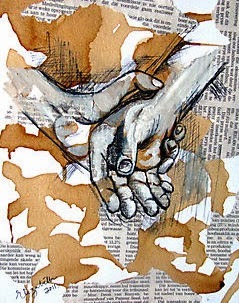 I used coffee and ink to create the woman's face. A4 size on watercolour paper. Available. Birch trees fascinate me. They are different. Strong, white, wonderful. I so enjoyed painting my own birch trees today, joyful hours passed by. I don't think while I paint. I only enjoy: the contrasting colours, the use of my palette knife, the quiet surroundings. Thankyou God for the talent You gave me. May this painting bring joy to someone else. Acrylic paint on blocked canvas. The size: 52 x 90 cm. I received a WhattsApp message from an arty friend early this morning: "Painting is silent poetry." Wonderful! I love poetry, I love words, I love languages. And yes, I adore art. To admire other artist's art and to paint my own. I can do it every day and won't get tired. Never ever. Here are my latest silent poetry pieces. I hope you enjoy them as much as I did while painting it. A landscape, using different techniques with brush as well as palette knife. Available. While flying home from the Cape where I visited my children, I could stare out from the window for hours, wondering about the different beautiful sceneries underneath. Available. A painting from my imagination. I just love nature and all its joy! Available. Very nicely framed and in the buyer's house. Many thanks ! Clouds fascinate me, I had to paint them! A winter scenery. SOLD. Thanks to the buyer! Available. Clouds, painted with a palette knife, fingers and a brush. Joyful! The colourful feathers of a rooster ! Available. Mother Hen and her chicks. Available. The winter made an impression on me....I guess! Different seasons have different colours: autumn is a favourite season. SOLD. Love to paint trees! Their huge trunks are wonderful, roots above the ground... Available. A walk in the forest during midnight can be interesting, don't you think? SOLD. Fresh fom the paletteknife, I painted this happy picture today! Spring is here and there are flowers everywhere. Smell them and enjoy your day! SOLD.